Research is not only critical to the economic and social development of society; it is also critical to the mission of our University. It is this research which is the foundation for knowledge that makes possible so much of the innovation and application that provides wider benefit. Research, adds to the stock of global knowledge and provides the source of new ideas, methods, techniques and innovation across a whole range of disciplinary and multi-disciplinary areas. Our mission is to support and empower teachers, leaders and scholars to succeed in their educational endeavors. 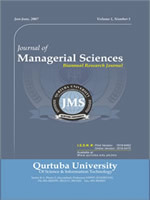 Qurtuba University of Science & IT publishes two journals The Dialogue (Quarterly): Social Sciences and Journal of Managerial Sciences (bi-annual): Management Sciences - to disseminate scientific research results both within Pakistan and internationally.